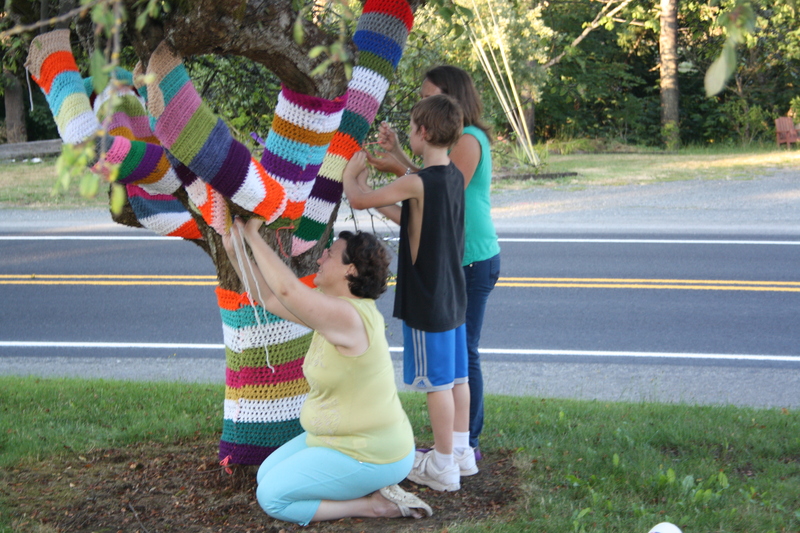 Last summer I helped organize and install a yarnbomb (a large public display of fiber art made of hand knit and crocheted fabric) in my hometown. It was awesome! And I’m doing it again this year. 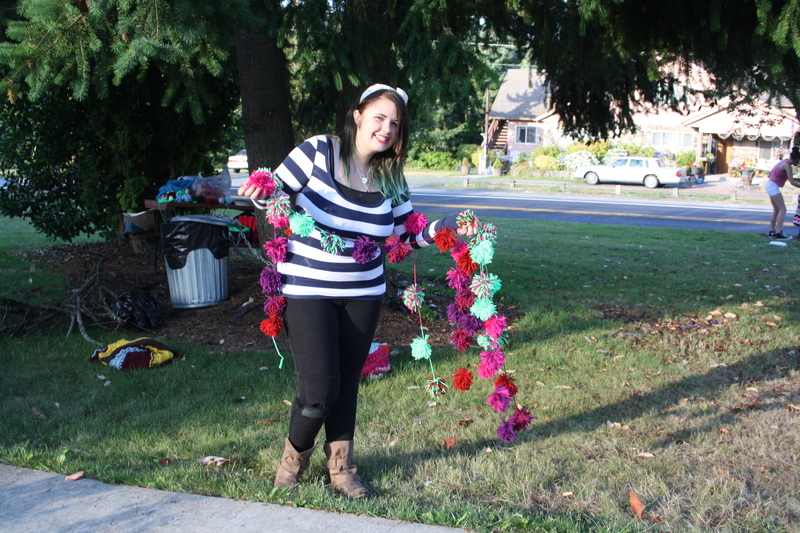 It started as a fun idea for a community art project then turned into something bigger and better. We ended up using our art to help raise money for local public school students’ negative lunch accounts. It was successful in putting an end to the practice of trashing lunches over insufficient funds and prompted the school district to enable “robo-calls” (automated calls home telling parents about lunch balances that are low). My own children experienced the lunch lady yanking their lunch and trashing it over their lunch account balance being in the negative. However, I had no idea the what the balance was at the time since I paid up for a couple months and figured they would send home a notice when the accounts needed refilling. They didn’t and what happened left my kids hungry and upset, with good reason. My mama-bear instincts came out and I had words with the principal, lunch staff, and even wrote a letter to the school board. Yet, I was hearing that nothing had changed in the cafeteria. That’s why we put our art to good use by starting https://www.facebook.com/Eatonvilleyarnbombers?ref=bookmarks to help make a difference for students who find themselves low in lunch funds. Kids have to eat to learn. Period. 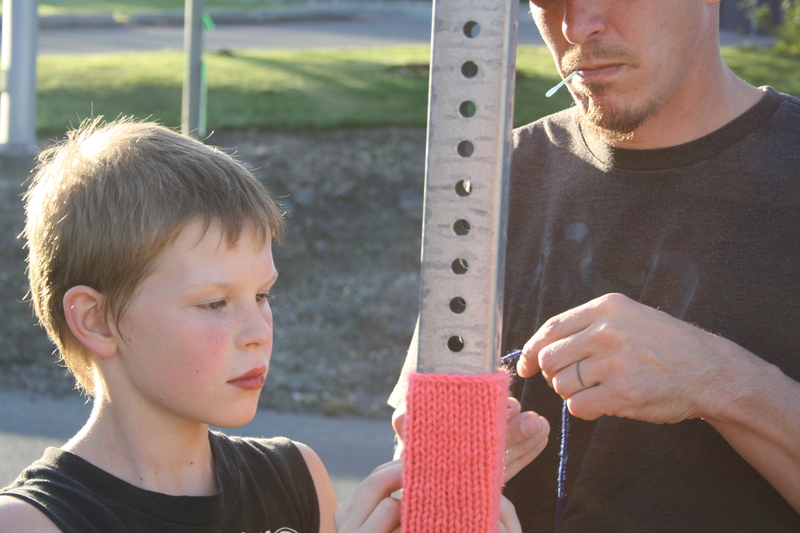 Crafty men in my life lending a hand with the yarnbomb install. Rubin and dad, Evan. 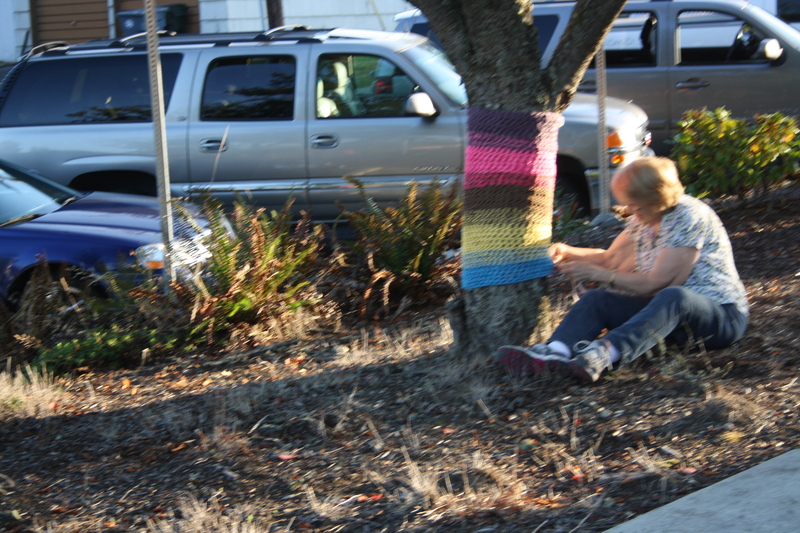 Yarnbombing for Lunches crew (most of us anyway). Group effort with this tree. Lisa, Rubin, and I tackle it in no time. Donna, Karen’s mama, putting the finishing touches on this tree. 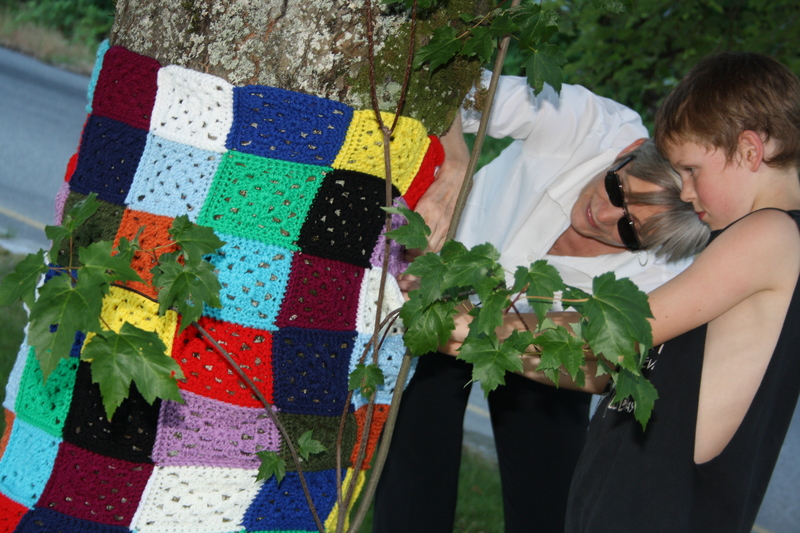 My mother-in-law, Tracey, and my son, Rubin, putting up a funky granny square piece. 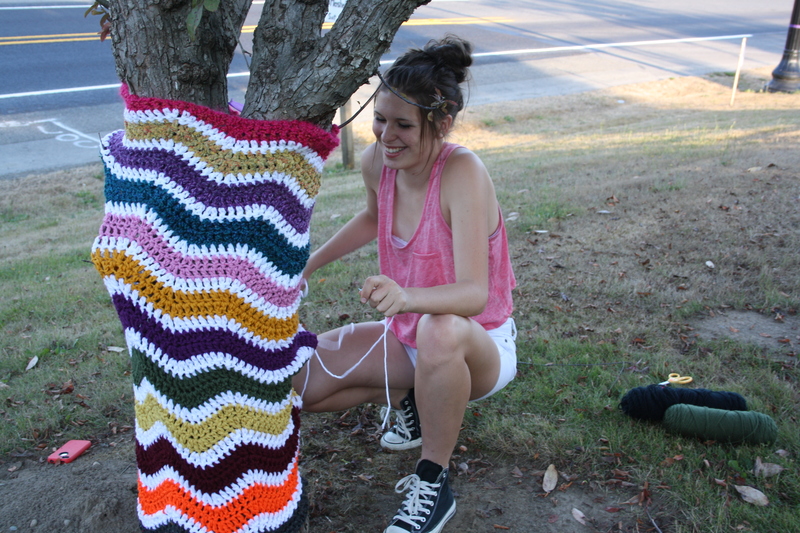 My daughter, Emma, helping with installing a yarnbomb at the park. Jade with her pom-pom string ready to decorate a tree for the instillation. 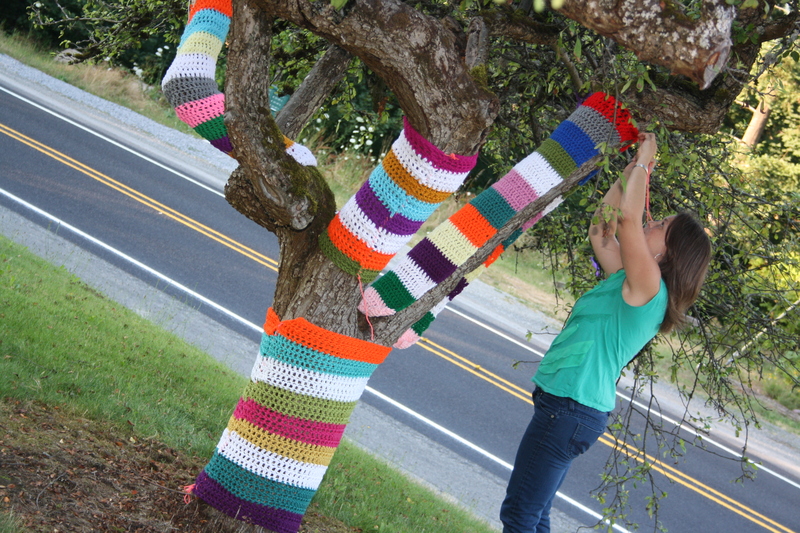 My daughter, Faith, and my hubby, Evan, attaching a yarnbomb to a tree in the park. Gwen and her hubby working on installing another piece on a lamp post. 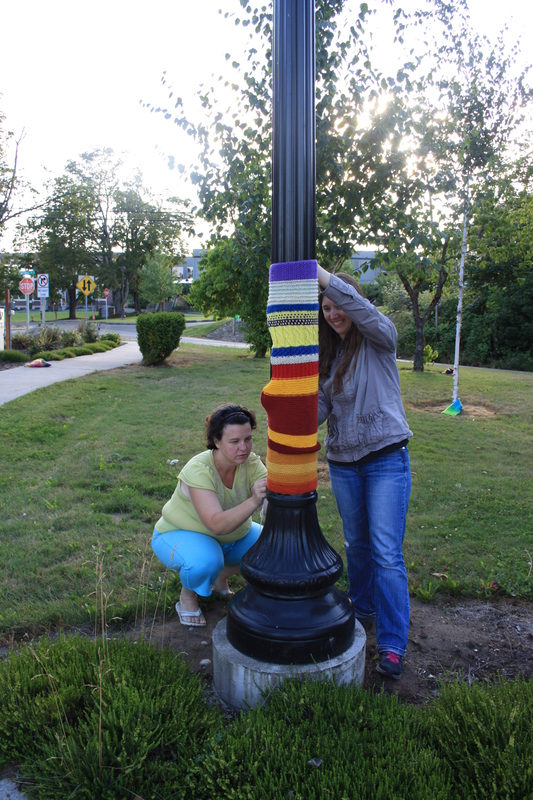 Sherry helping Lisa install her yarnbomb piece on a lamp post. This was a year-long project in the making, but worth every minute! It was a lot of fun to create, especially knowing how meaningful the outcome would be. We received yarn donations form many different states after I put a request in the Ruralite magazine (our utility company’s publication). The response was amazing! 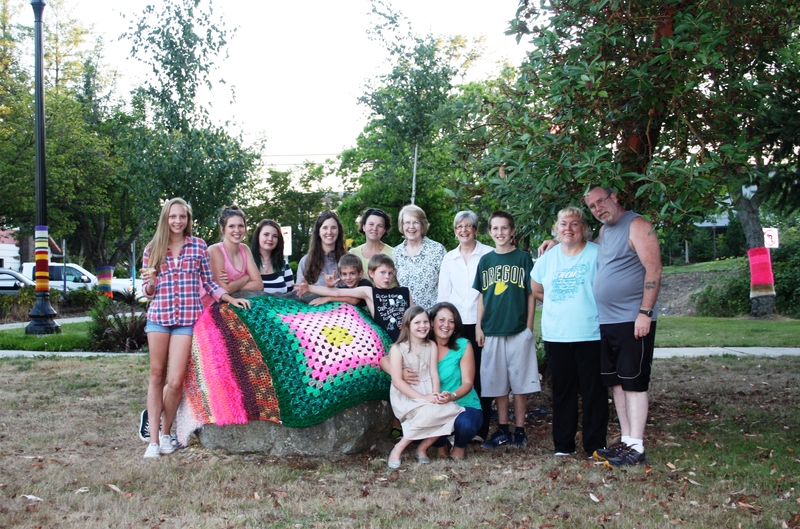 The generosity of complete strangers touched my heart and helped make the yarnbomb better than I could have imagined! Even Lion Brand Yarn Company was kind enough to send us a box of cool yarns. 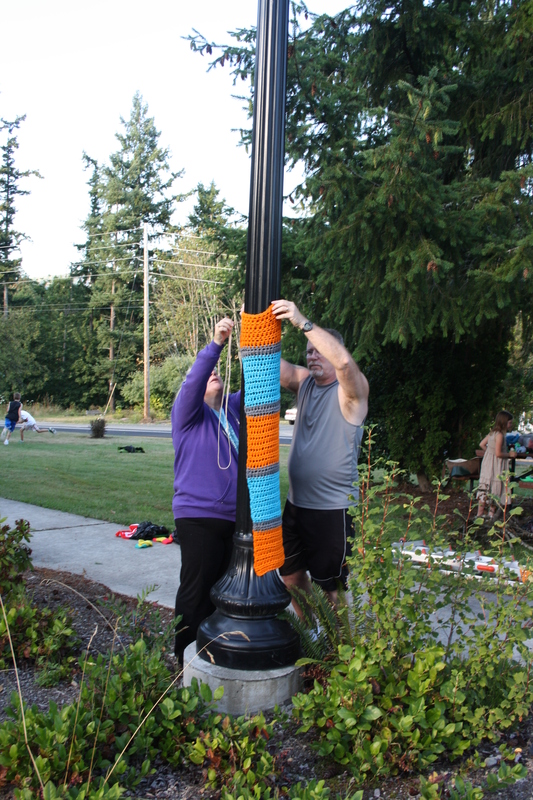 Thanks to everyone who had a part in the Eatonville Yarnbomb of 2014! Thanks! It was amazing to see in person. The pictures don’t do it justice. This summer will be another fabulous display, pictures to come!